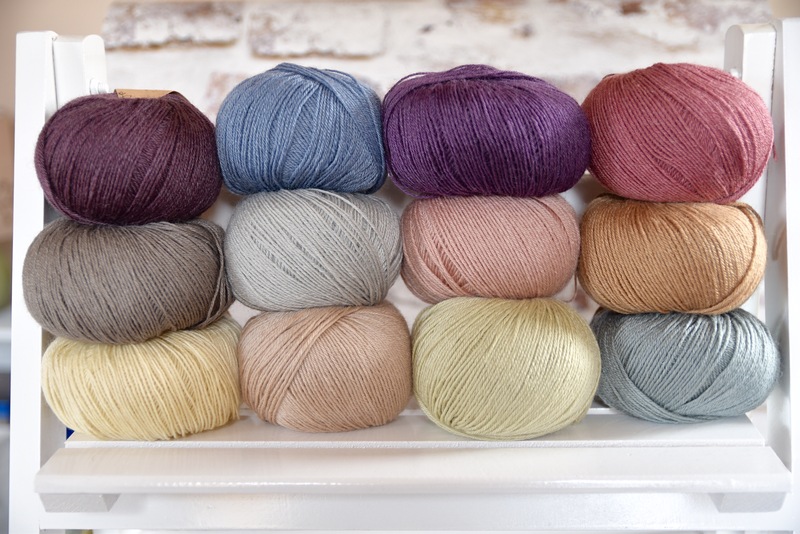 I thought I might introduce you to the new-new shades of Milburn 4ply which arrived yesterday. 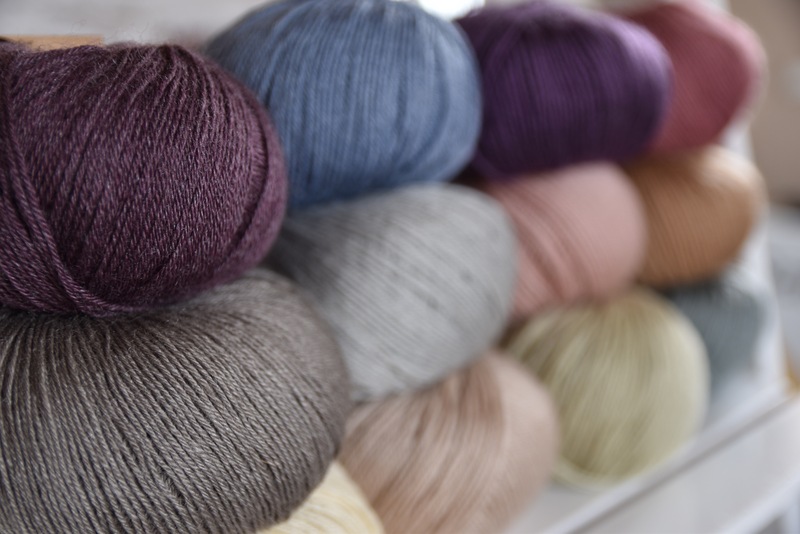 They’re HERE on the website firstly, and the 500g packs get a little discount so if you want a sweater quantity you’re best picking one of those and then getting any additional balls. 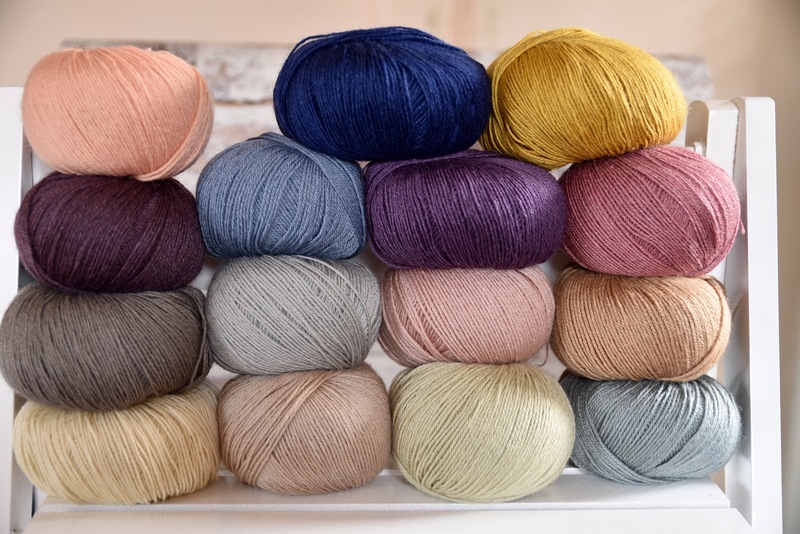 Let me tell you a bit about the new colours – they bring the palette of Milburn shades up to 15, and they’re all really well matched from my samples that I sent to the dyer (who is based not far from here). I’ve added in another neutral shade so there are four now – natural cream, two greys, and Wicker, which is a light oatmeal-beige. 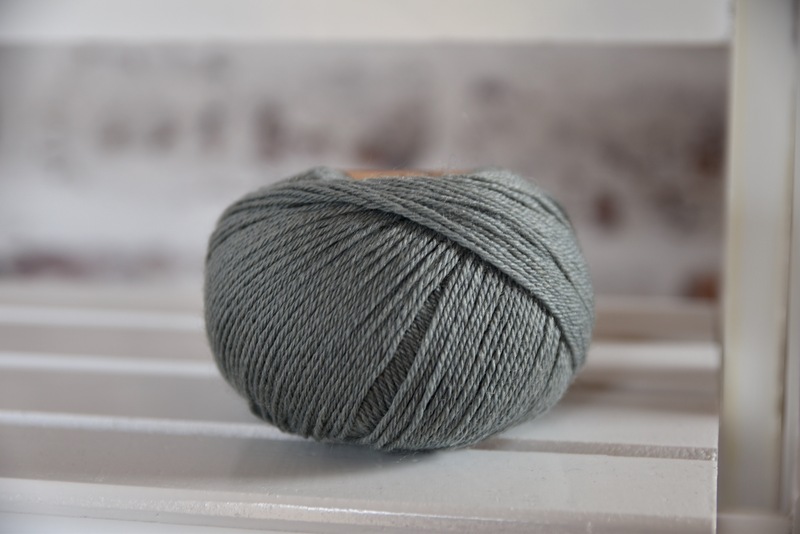 I also added a couple of greens; I love green and dye various shades of it a lot but somehow neglected to have any green Milburn, so I came up with a lovely sage and a sort of dusky teal (I suspect many people will see it as blue, but to me it’s teal!). The first shade here is Althaea; that’s a genus of plants which include marshmallow – I had loads in my previous garden and harvested seeds from them to bring to my current one. Anyway the ones I had were a soft dusky pink, hence being the inspiration for this colourway. It’s a warm, vintage sort of pink, and the warm tone means it goes well with other warm shades like browns, golds, oatmeals, and aubergine. Next up we have Wicker; this is what I’d describe as beige, or maybe oatmeal. 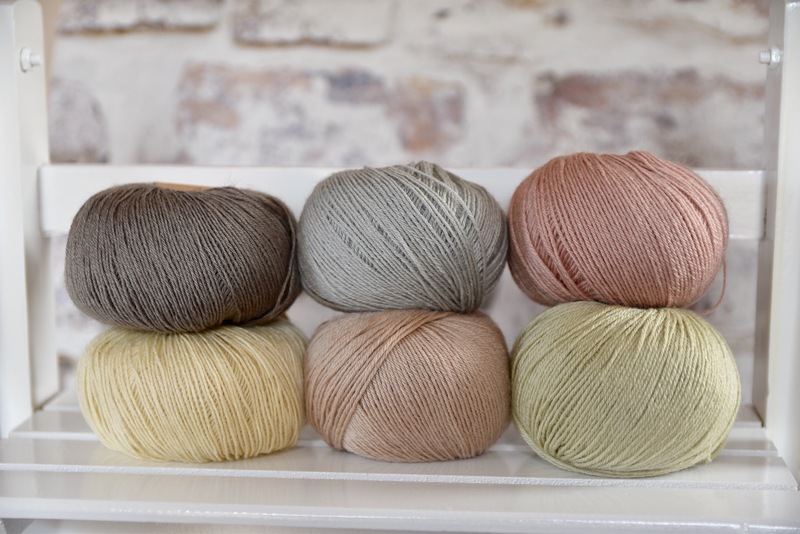 It’s the fourth neutral shade that I mentioned earlier, and it goes beautifully with just about any other colour. I like it alongside the greys and cream but more on that later. This is the first of the two greens I was talking about – this one is Thyme and it’s a soft spring sage. Again, because it’s a warm shade it goes with lots of others, like most pinks, warm blues, and anything earthy. This next one is Catmint; this is the one that to me is a soft dusky teal but I’m fairly certain some of you will see it as blue or grey, or a greyish blue! This one goes with lots of other blues, and well as pretty much everything else I’ve put it next to! Finally we have Black Tulip. I love black tulips! I’m hoping mine will reappear in the trough I put them in this year. There are only a handful but they’re beautiful and this colour looks dramatic both on its own and as part of a palette of other shades. If you go for a palette of light shades this adds a pop of contrast without being too jazzy. 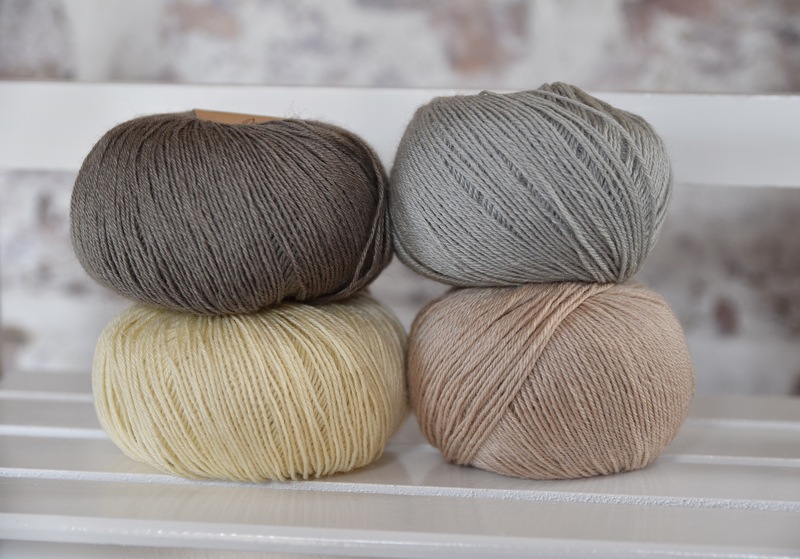 As promised, here are the four neutral shades together. 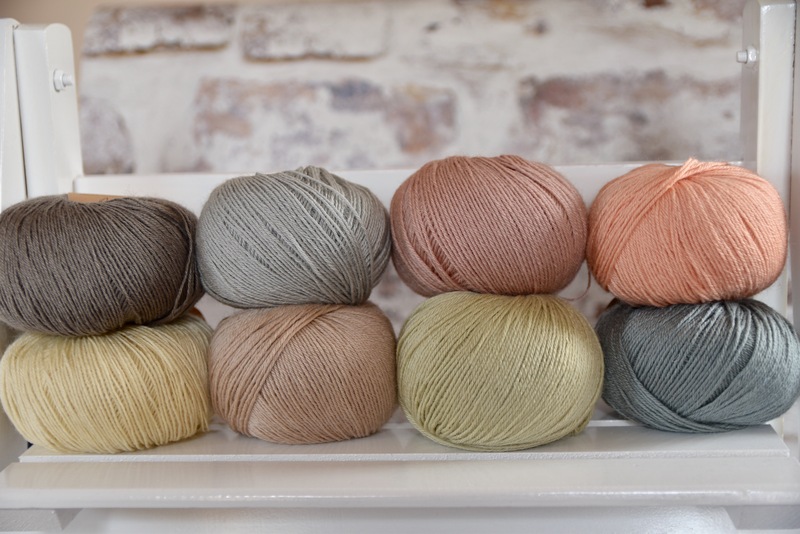 Wouldn’t they look great as a delicate lace shawl or a light, cosy sweater?! 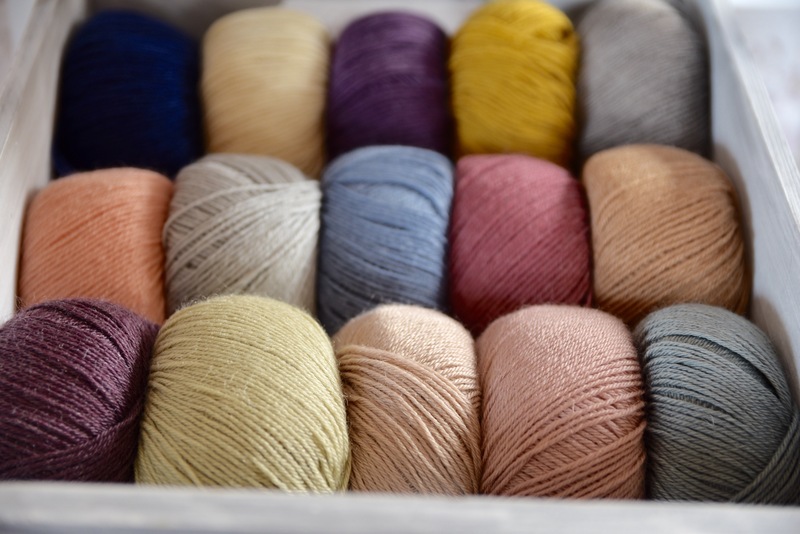 You could add a pop of colour such as Harvest Gold or Damson to lift the palette as well. Next I tried adding Thyme and Althaea to see what the six together would look like. I like this – it’s soft and pretty but not all sugary and twee (IYKWIM). I work hard to keep my light colours classy and sophisticated which is why it’s so important to me that my colours are matched exactly as I want them. Bluefaced Leicester as a fibre really lends itself to this too as with that lovely lustre it maintains that timeless look. Well I think so anyway! I carried on adding colours, so next I added Tea Rose and Catmint; I think Tea Rose really lifts the whole palette and Catmint adds a good level of contrast. Ok, just to take things further, here is a wider palette; I think this would make a great Ripple Blanket or C2C blanket, amongst other things. I swapped Tea Rose out and brought in Autumn Fields instead, then added (top row: L-R): Black Tulip, Estuary, Damson and Bramble. I’ll leave it there for now! I hope you like what we’ve done anyway. 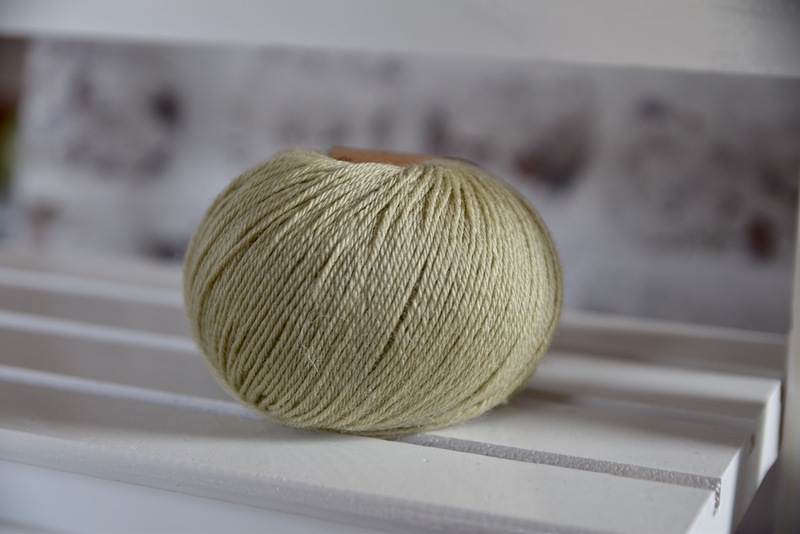 This yarn is my signature bespoke yarn and it’s a delight to be able to bring more shades to the palette. Some of you may notice the price has increased a little and I wanted to talk about that. 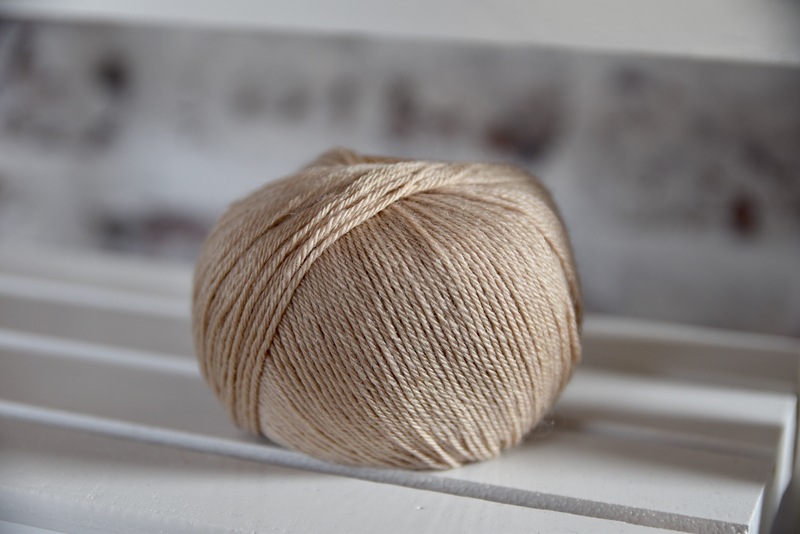 Last year the cost of wool increased (it goes up a bit every year but this was more of a jump), and that trickled through to Milburn 4ply around November time. Since then we’ve known we’d have to increase our price at both wholesale and retail, but wanted to hold off and see if we could absorb it. The short of it is that we can’t. We don’t need to make a huge amount of profit, but we do need to make enough to cover our overheads (which are much higher than you might think as we pay VAT and corporation tax as well as everything else), and then just pay myself and Sparkles. I’m on less than minimum wage – I’m paid an amount I can get by on and then at the end of the year if we’ve made a profit after corporation tax I can take that as dividends. Sparkles is paid more than that, but I see it as a company investment because she has skills that I need and I don’t want to end up hiring and firing a stream of people, which I know has happened to a few other business owners that I’m friends with. Apologies that this has turned into a detailed lecture! I really just hope it’s informative, and I just wanted to say that we don’t raise our prices unless we really do need to (why would we do it and risk losing customers if we didn’t need to?!). 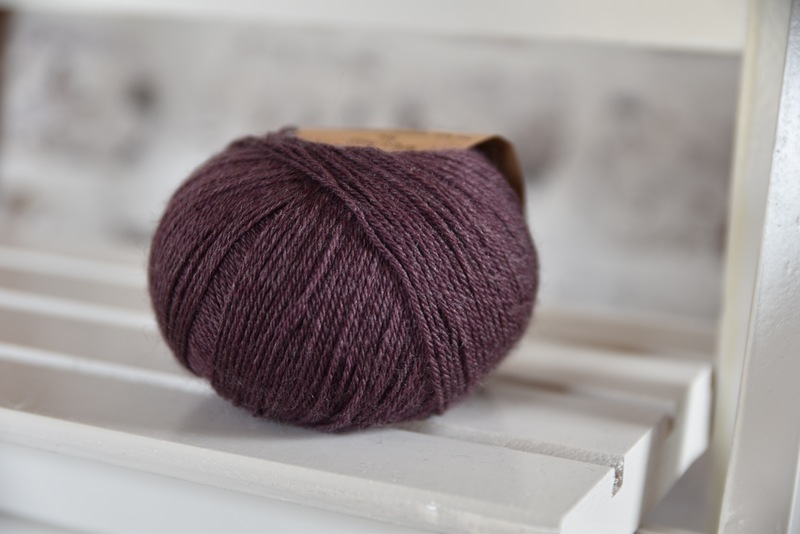 Milburn 4ply isn’t a budget yarn though, really, it’s designed to be a high-end yarn which comes in just below the price of hand dyed, and given how well it knits up and wears, I think it’s decent value. The bluefaced Leicester that we use for it is the absolute best of the crop and you can feel and see that in the way the yarn doesn’t pill, and remains soft and strong even with a lot of wear (I can say that now that I’ve had socks and garments in it for a couple of years that still look and feel as good as new!). Ok, lecture over! 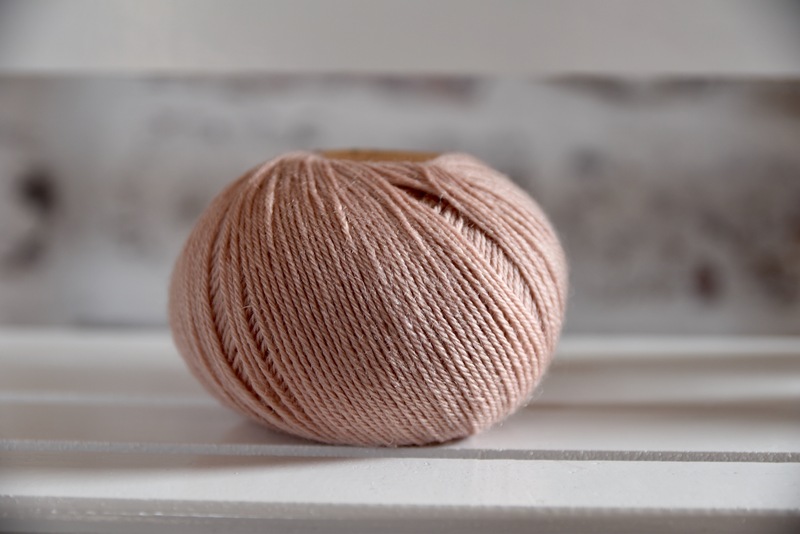 Happy knitting and crocheting, and thankyou as ALWAYS for the wonderful support that you all give us, we appreciate it so much as we love our jobs and simply want to continue providing a little beauty for everyday life. They’re lovely shades, very tempting! I wouldn’t call that a lecture at all, just explaining what’s involved.